Check our official code reference , especially MercadoPagoCheckoutBuilder object to explore all available functionalities. You can define one color (your main color) and we will take care of the rest. Delivering the best Checkout experience based on your color. If you need an advanced color customization, you can customize your colors through our PXTheme interface/protocol. Check the PXTheme methods in our reference guide. @objc optional func fontName() -> String? @objc optional func lightFontName() -> String? @objc optional func semiBoldFontName() -> String? We provide PXTrackerListener protocol to notify each tracking event. You can subscribe to this protocol using PXTracker. 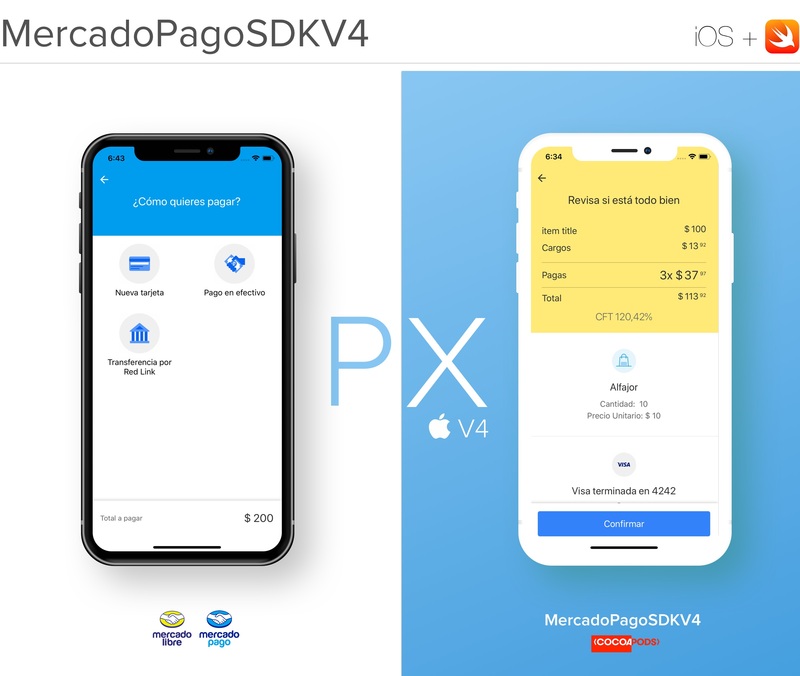 This project include an example project using MercadoPagoSDKV4. In case you need support contact the MercadoPago Developers Site. Fork this project and propose your own fixes, suggestions and open a pull request with the changes.